Indian has many beautiful temples one such is Swaminarayan Akshardham. It is located in Gandhinagar district of Gujarat and is spread over 23 acres in area. The temple is built to pay tribute to Swaminarayan, his life and his teachings. 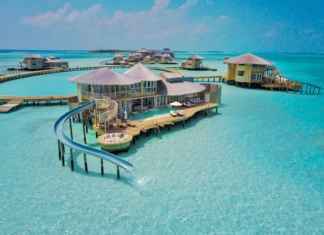 It is one of the most magnificent temples in India and is beautifully created. The temple is a Hindu worship place and a spiritual and cultural campus dedicated to devotion, education, and unification. The temple consists of a worship area, 5 exhibition halls, garden a fountain where light shows happen. And it also has a research Centre and library. Akshardham Temple in Gandhinagar is one of the largest and most prominent temples in the entire state of Gujarat. Amazed by the details? Akshardham temple is built using tons of pink stones brought all the way from Rajasthan. This temple is 108 feet in height, 240 feet long and 131 feet wide. It took 13 years to complete the temple and was inaugurated in 1992. The temple follows the Vedic architecture principles and there are no iron and steel structures used in the construction. It is built in the middle of a huge garden known as sahajanand Van. The unique thing about this temple is the way it has been built, it has three floors. Centre of faith, vibhuti mandalam, and the third floor beholds clothes and other things of Swaminarayan. 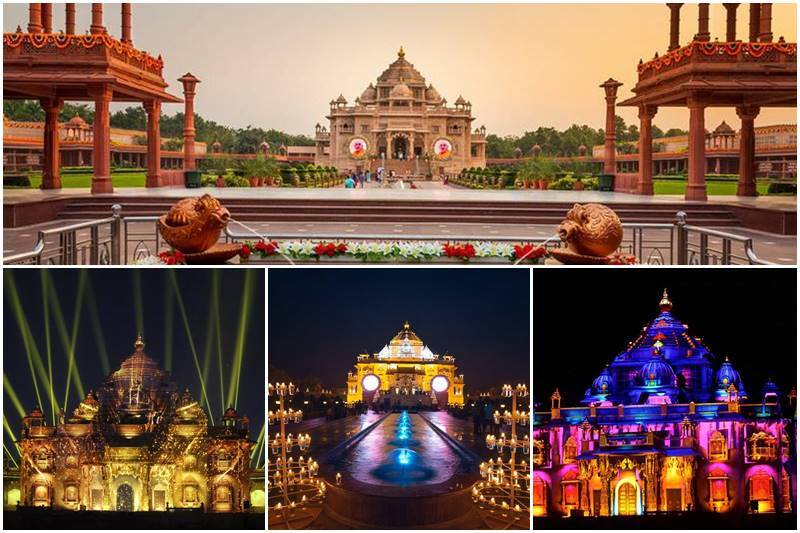 The Akshardham mandir consists of 97 intricately carved pillars, 17 ornate domes, 220 stone beams, 57 stone screens, 3 porticos, 8 balconies, and 256 statues of spiritual personalities. The central chamber of the temple has 1.2 ton (7-feet long) gold-plated idol of Lord Swaminarayan, the chief deity of Akshardham temple. The temple complex consists of exhibition halls, open green lawns, in-house theaters, etc. A light display also happens on the weekend. 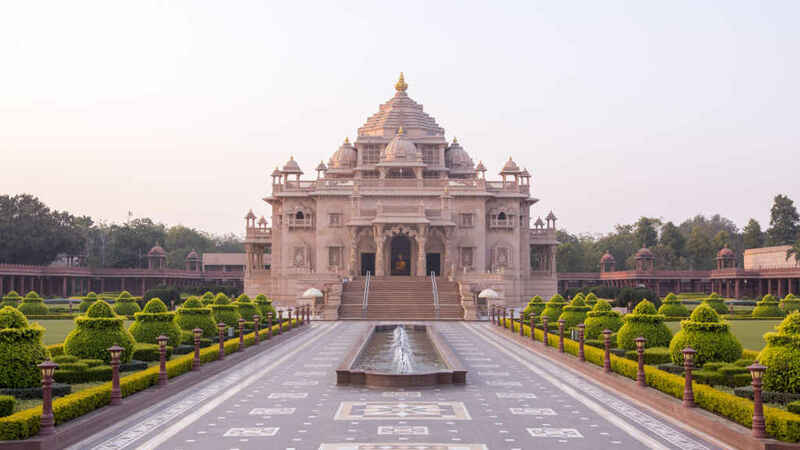 Each element of Akshardham echoes with spirituality – the mandir, the exhibitions, and even the gardens. There is also a center for research on social harmony named AARSH. On September 24, 2002, two armed terrorists attacked Akshardham. In the attack, 33 people were killed and 70 were harmed. 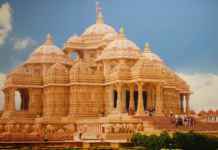 No matter you are a devotee or not but you must visit Akshardham. You will love the intricate architecture, the traditional Indian beauty, and the tranquility that the temple has.